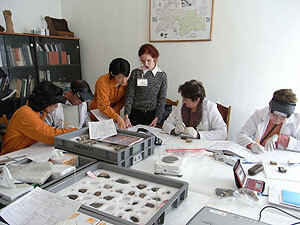 On December 4, the students came to study restoration of cultural properties. They toured the Library of the Department of Research Programming on the second floor and the Training Section of the Japan Center for International Cooperation in Conservation on the fourth floor. Those in charge of each facility provided explanations and answered questions. On December 19, the students toured the Conservation Science Section and Restoration Studio of the Center for Conservation Science and Restoration Techniques on the third floor and the Center’s Analytical Science Experimental Laboratory on the fourth floor as part of “Exploratory Practical Learning (Tokyo Training) in Cooperation with the National Museum of Emerging Science and Innovation”, the main event of the Super Science High School (SSH) project that Masuda High School promotes. Those in charge of each facility provided explanations and answered questions. 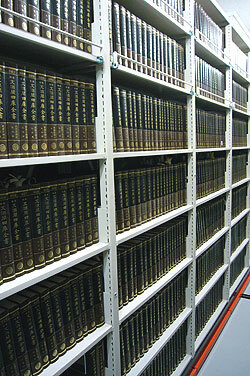 The bibliotheca of the late Suzuki Kei, Professor Emeritus at Tokyo University and a member of The Japan Academy, was donated to the National Research Institute for Cultural Properties, Tokyo (Prof. Suzuki died on October 18, 2007 at the age of 86). Among his books, all 1500 volumes of “Wenyuange Edition Siku Quanshu”, over 500 volumes of Si Bu Cong Kan Chu Bian Suo Ben and Da Qing Li Chao Shi Lu were offered by his bereaved wife Teruko, and brought to the Institute on December 11. As is widely known, Siku Quanshu was compiled by order of Qianlong, Emperor of China, and is highly valuable because it is the largest Chinese classical encyclopedia. This Institute praises the academic contributions of Professor Suzuki, who was the leading authority on Chinese picture history. We will consider the use and conservation of precise materials and proceed with formatting so that they can be used by many researchers. We also plan to issue a volume tentatively entitled Catalog of Books Donated by Professor Suzuki Kei next year. 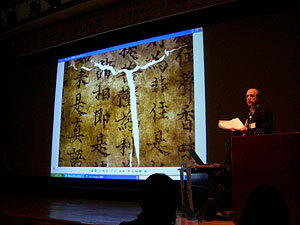 For three days from December 6 to 8, 2008, the National Research Institute for Cultural Properties, Tokyo hosted the 32nd International Symposium on the Conservation and Restoration of Cultural Properties entitled Capturing the Original: Archives for Cultural Properties in the Heiseikan Auditorium of the Tokyo National Museum. The purpose of this symposium was to consider how “original” cultural properties may be transmitted to posterity without affecting their essential value. Presentations were given and discussions were held by 25 persons, including 5 persons from overseas (USA, UK and Taiwan). In Session 1 (“Confronting Objects/’Originals’”) on the first day, the fundamental stance towards cultural properties was re-examined, seriously considering those objects deemed to be “original”. In Session 2 (“’Originals’ beyond Objects”) on the second day, various matters that remind people of “originals”, either those that remain or materials related to them, were chosen as topics. In Session 3 (“Handing over ‘Originals’”) on the final day, ways of operating archives for cultural properties that support and transfer the originals were examined, based on the discussions up to that point. A total of 281 participants attended the symposium during the three days. There was great interest in the theme of the symposium, which especially sought to capture “originals” from the standpoint of archives for cultural properties. Although focus was placed on Japanese and East Asian art, western aesthetics, contemporary art, and intangible cultural properties were also considered. The Department of Research Programming, which is in charge of the Institute’s archives, served as secretariat for this symposium. There were numerous matters to be considered regarding how cultural properties should be documented while focusing on the original. The Department will continue to deal with these big topics. A detailed report of the presentations and discussions will be published next year. 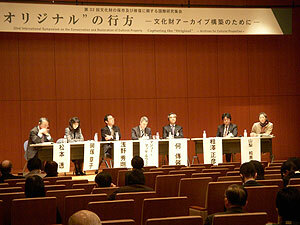 On December 16, 2008, the Department of Intangible Cultural Heritage held a public lecture in the large lecture room of the National Noh Theater. Since 2006, the Department of Intangible Cultural Heritage has held lectures on audio recordings made by the Cultural Properties Protection Comission (currently the Agency for Cultural Affairs) in the past. This year, a recording of noh-bayashi (musical accompaniment to noh) was introduced in a lecture that focused on the changes in noh as traced by audio materials. It appears that the main purpose of the recordings of noh-bayashi made in 1951 was to document the performances of Kawasaki Kyuen, an o-tsuzumi player, and Ko Yoshimitsu, a ko-tsuzumi player. Both Kawasaki and Ko received the first individual recognition as holders of important intangible cultural properties (socalled “Living National Treasures”). This lecture allowed listeners to hear the consummate art of the two masters who supported noh in the Taisho and Showa periods and to learn about the significance of the recordings made by the Agency for Cultural Affairs in the past and the relationship of the recordings with the transmission of noh. The Department of Intangible Cultural Heritage is planning to hold another lecture next year based on audio materials made by the Commission in the past. 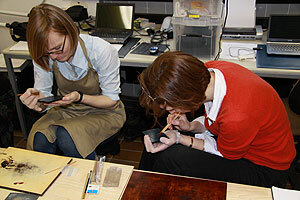 The Center for Conservation Science and Restoration Techniques held an Urushi restoration workshop at the Cologne Museum of East Asian Art in Germany as part of the Cooperative Program for the Conservation of Japanese Art Objects Overseas, in 2008. We held workshop I (elementary practice) with 10 trainees on November 5-7, workshop II (for first-time participants) with 10 trainees on November 8, workshop II (for students) with 7 trainees on November 8, and workshop III (mid-level practice) with 7 trainees on November 11-14. Two instructors who were experts performed restoration work at the local site. All participants were persons who were highly interested in the restoration of Japanese traditional Urushi lacquer works, such as curators and cultural property restorers from various parts of Europe outside of Germany as well, including the UK, Switzerland, Austria, and Poland. At these workshops we held various programs, including a report on examples of overseas Urushi lacquer works, the creation of Urushi spatulas, adhesion with mugiurushi and attachment with kokuso using hand plates for restoration practice, and core stretching practice using thin bamboo sticks. All the trainees were eager and asked many questions, resulting in a successful training session. On December 15 and 16, we held trial training for 40 curators who are in charge of conservation in museums and art galleries: They studied the characteristics of atmosphere and indoor air contamination materials, damage examples, control methods, monitoring plan drafts, and examples of countermeasure implementation. We continued difficult lectures and demonstrations, including state-of-the-art research results and technical content, in order to teach the ability to establish specifications for measuring contamination materials, read reports, evaluate the results, and determine countermeasures with architects and air-conditioning engineers. All participants worked diligently and earnestly. The provision of a glossary, acquisition of information on necessary equipments and spaces, and other aspects of the workshop were highly regarded, and there were many requests for future disclosure on the Internet (38 of the participants expressed 100% satisfaction). 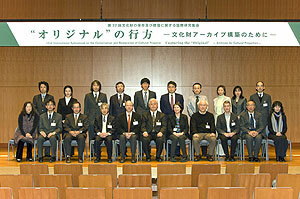 On December 4, 2008, a seminar on the theme of conserving energy at museums with a view to maintaining an appropriate environment for cultural properties was held in the seminar room of the National Research Institute for Cultural Properties, Tokyo. This theme had been chosen at a meeting of the Center for Conservation Science and Restoration Techniques as one that the Institute would study in cooperation with museums. Two lectures were given at this seminar: Mr. Maekawa Shin of the Getty Conservation Institute (USA) spoke on energy conservation for museums with consideration for storage and display environment and Mr. Shiraishi Yasuyuki of the University of Kitakyushu spoke on comprehensive assessment system building environmental efficiency (CASBEE) and its case studies. Reports on concrete endeavors on this matter were also given by the Kyushu National Museum and Saitama Prefectural Museum of History and Folklore. A total of 141 people participated in the seminar and held active discussions. Funded by grants from the Institute and UNESCO/Japanese Funds-in-Trust, the Japan Center for International Cooperation in Conservation invited Afghan and Iraqi specialists engaged in the conservation of cultural heritage and archaeology, and conducted training for capacity development and transfer of techniques. Two archaeology specialists from Afghanistan were invited from the Institute of Archaeology in Kabul: Mr. Ketab Khan Faizy and Mr. Ruhullah Ahumadozai. They received training in archaeology for 5 months, during which time they participated in on-site excavation and studied the methods for excavation and measuring of sites and objects not only at the National Research Institute for Cultural Properties, Tokyo, but also with the cooperation of such organizations as the Tokyo Metropolitan Buried Cultural Property Research Center, Nagareyama City Board of Education and the Nara National Research Institute for Cultural Properties. Two Iraqi conservator were invited from the Iraq National Museum: Ms. Buthainah M. Abdulhussein, Director of the Central Laboratory of Restoration and Conservation of Antiquities, and Mr. Thmar R. Abuduallah, a conservator. The two received 6 months of training from July to December 2008 on conservation, mainly of wooden artifacts, as well as practical training to acquire relevant conservation techniques. This project was conducted with the cooperation of various domestic institutions for conservation, such as the Nara National Research Institute for Cultural Properties, the Shizuoka Research Institute for Buried Cultural Heritage and the Kyushu National Museum. The trainees practiced conservation of wooden objects at the National Research Institute for Cultural Properties, Tokyo and of metal objects at the Nara National Research Institute for Cultural Properties. They further learned basic scientific investigation methods for wooden materials at the Shizuoka Research Institute for Buried Cultural Heritage and about the latest analysis devices including 3-dimensional CT scanners at the Kyushu National Museum. The Japan Center for International Cooperation in Conservation intends to continue to assist in the capacity development of specialists who are engaged in the conservation of cultural heritage in Afghanistan and Iraq through similar training courses. Since 2008, the National Research Institute for Cultural Properties, Tokyo, has been working on the conservation and restoration of mural pieces owned by the National Museum of Antiquities, Tajikistan, together with the Institute of History, Archaeology and Ethnography, Academy of Science, Tajikistan. As part of this project, we invited a total of six specialists in conservation and restoration to Tajikistan from Uzbekistan, Kazakhstan, Kyrgyzstan, and Turkmenistan, and held a workshop at the National Museum from December 5 to10. In the ruins of Central Asia, beautiful murals from the 5th to 12th century were discovered, but the number of specialists who can conserve and restore the murals is insufficient, so conservation and restoration activities have been delayed. Also in this area, mural conservation and restoration methods established in the former Soviet Union were widespread, so common problems have occurred, such as color change color of the mural surface due to the deterioration of reinforcement. At the workshop, we asked participants to report on the current status of conservation and restoration of murals in their home countries. We also introduced the new trials that we had performed in Tajikistan, and requested them to actually experience them in their work. We will hereafter hold similar workshops in which Japanese specialists and those at the local site will work together and exchange opinions, aiming to promote conservation and restoration activities for the murals in Central Asia, and improving the conservation and restoration methods thereof. The archaeological training of Afghan specialists started in the middle of July as part of the Safeguarding of the Bamiyan Site project, and continued until the middle of December. The two trainees, Mr. Ketabhan Faizy and Mr. Ruhullah Ahumadozai, finished their five month long training and left for Afghanistan on December 22. 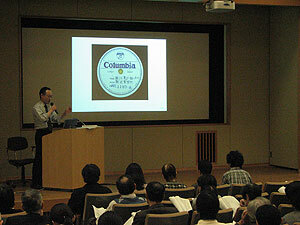 In these training sessions, practical training was done under the cooperation of various organizations, including the Tokyo Metropolitan Buried Cultural Property Research Center, the Nagareyama City Board of Education, and the Nara National Research Institute for Cultural Properties, as well as the National Research Institute for Cultural Properties, Tokyo. The trainees worked in the field sites of excavation and study implemented by these organizations and learned methods for excavation and measuring the remains and relics through hands-on practice (see photos 1 and 2). The Afghan trainees sometimes experienced difficulties during the long training sessions in a foreign country, but they not only learned the expert knowledge and skills of archaeology, but also became familiar with Japanese life and culture, and had a productive training period. On December 17, a meeting was held at the Institute to present training results, and the participants reported on what they had learned during training as well as the latest archeological information in Afghanistan. The Japan Center for International Cooperation in Conservation plans to continue cooperating in fostering those who will be engaged in conservation of cultural properties in Afghanistan through these training sessions.